While buying skates online offers great convenience, going to the store in person will allow you to try on a variety of skates. In the end, you're more likely to find the perfect fit for your foot. Some stores and skate brands also offer special inserts that can help you find the right fit. "The fit is the most important thing. Making sure the skate isn't too wide or too short form front to back," said T.J. McMeniman, Bauer's Senior Global Brand Manager. 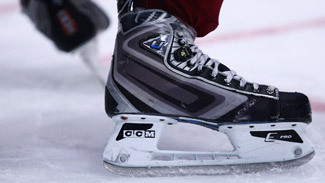 "Some players like skates that are a bit shorter so their toes are a little crunched. You want your toe to just feather at the very tip of the skate." If you buy your skates in a specialty hockey shop, don't hesitate to ask questions and see if it's possible to get any adjustments made. Some skate shops may even throw in free sharpenings and adjustments over the life your skates. One of the most popular in-store adjustments involves using heat. If they prefer not to do it at the store, some people use a hair dryer, which can be applied to the boot of the skate for 2-3 minutes before trying the skate on to mold it to their foot. Some specialty shops even offer to help you "bake" your skate before you leave the store, so feel free to ask about that. More adventurous players can even use the convention oven in their kitchen (with parental permission and supervision, of course). Start by pre-heating the oven to 180 degrees Fahrenheit. Prep your skate by loosening its laces enough so that you won't have to worry about placing your foot in once you're done. Once pre-heating is complete, turn off the oven and place one of your skates on a standard baking sheet before placing it directly on the center of the oven rack. Let it bake for six to eight minutes and watch the skate for any breakdown or splitting of the material before removing it. When you take it out, the boot should be noticeably softer when you squeeze it. "We highly recommend when you purchase our product that you have the local retailer heat up the skate for a couple of minutes in the oven and let the skate mold on your foot for about 15 to 20 minutes," said McMeniman. "Don't walk around, you just want to sit there and let it mold to your foot to give it a customized fit." Bear in mind that too much heat can potentially result in a premature breakdown of the boot of your skate. Some players also just prefer to break in skates the more natural way. As with most tasks, there is no substitute for hard work when it comes to breaking in new skates. There are a few short cuts, but there's nothing quite like molding a skate to your foot by simply lacing up and taking the ice, which is ideally what you want to do anyways. The first skate will definitely be arduous and your feet will likely feel sore both during and after. But by your third skate you should notice greater ease when putting on and using your skates. By the time you've enjoying about a half-dozen skates, you should notice a clear difference when it comes time to finding a snug fit when you lace up. However you decide to break in your new skates, you should start noticing a difference with a few basic steps. Then you can worry about more important things, like winning hockey games.